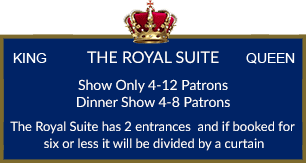 2 Course Dinner & show = Two courses, Entree and Main Meal included. 3 Course Dinner & show = Three Courses, Entree Main and Dessert included. Please scroll to see complete floor plan.